Abstract: Sometimes you have to wonder if the amount of effort that goes into the packaging of a motherboard is indicative of the level of engineering vested in it. Sometimes you have to wonder if the amount of effort that goes into the packaging of a motherboard is indicative of the level of engineering vested in its design. In our case, the Epox 4B2A looks more like a high-end fashion purchase than a cutting edge socket 478 Pentium 4 i845-based motherboard. While the haut couture wasn't inside the fancy box with an integrated carry handle, a bunch of other goodies were. That addictive "new motherboard smell" greeted us as we opened up the 4B2A box to discover a USB bracket, some drive cables and a really well written manual. Epox's manual is clearly written and remarkably full of useful info to properly tweak the EP-4B2A into yielding the most from our 1.5GHz socket 478 Pentium 4 chip. With the din of skive heatsinks being tested in the background we dropped on an Arkua copper core 8568 and set about our work. 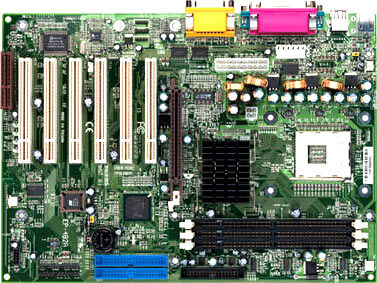 This is the first chance we've had to review an Epox motherboard and I should say that we were pleasantly surprised by the quality of the board and components - one look in the BIOS and you could tell a lot of work had gone into making this as good a solution as possible. Why go SDRAM and Pentium 4? The 4B2A is intended to offer users looking to jump on the new form factor Pentium 4 bandwagon a cost effective solution which skirts the previously expensive reliance upon Rambus RIMM's. While VIA's DDRAM and Pentium 4 motherboards are not quite yet commercially available on any significant level, SDRAM and Pentium 4 i845-based motherboards are. The benefits are largely in terms of cost, and upgrade paths, but given our quest for absolute performance does the EP-4B2A really have the tools it needs to deliver competitive performance? The Intel i845 chipset supports a 400 MHz system bus for the Pentium 4 processor while bridging the gap so that standard PC133 SDRAM memory can be used in place of what used to be an RDRAM only. Support for lower cost PC133 SDRAM also extends the P4's reach into value priced systems. The 593-ball FCBGA packed i845 chipset supports a 1.5V 4X AGP interface with over 1 GB/s of graphics bandwidth. In conjunction with the i845 chipset the 82801BA I/O controller hub (ICH2) delivers increased I/O bandwidth with dedicated data paths and direct connections from the memory and graphics for added peripheral support. The 82801BA is also used on I850, I815, and i810 chipset motherboards and is thus pretty standard at this point in the game. The 400MHz system bus of the i845 solution enables up to 1GB/s of data transfer from the PC133 SDRAM and 3.2GB/s of memory bandwidth to the Socket 478 P4 processor. Other features of the i845 chipset include an 4X AGP interface, 133MB/s to the PCI, support for four USB ports, six-channel audio, a generally unused LAN connect interface, dual ATA-100 controllers and the almost completely pointless CNR (communications and networking riser). The Epox EP-4B2A comes with a healthy six PCI slots, one AGP, one CNR and three DIMM's which will support up to 3GB of SDRAM.